The Jackson Court Hotel is a beautiful Georgian building offering homely comfort and hospitability. Ideally located in the heart of Dublin City and only minutes walk from Stephens Green with its beautifully maintained park and Grafton Street the most famous shopping street in Dublin. This hotel is just perfect for the business, leisure or shopping guest and the staff offer a warm cead mile failte and go out of their way to ensure that the guest will enjoy a home from home atmosphere. The hotel offers 25 beautifully maintained en-suite rooms which are furnished and laid out to a very high standard. The decor is soothing and tranquil to ensure a great nights sleep. The hotel offers all necessary facilities including direct dial telephones, multi channel TV, tea and coffee making facilities and trouser press. 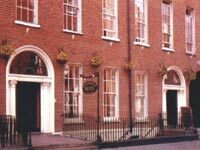 The rates include a full Irish breakfast and entrance to the well known Copper Face Jacks nightclub. The bar in the Jackson Court Hotel provides a great carvery lunch with a wide variety of tempting dishes. Or in the evening the visitor can avail of something lighter from the extensive bar menu. Copper Face Jacks is one of Dublin’s most famous night spots and the drink, music, fun and craic are mighty. Seven nights a week the guest can enjoy the amazing atmosphere of discreet lighting and soft furnishings surrounded by antiques. Ideally located on Harcourt Street, The Jackson Court Hotel is just a tiny walk from The Gaiety Theatre, The National Gallery, The Natural History Museum, The National Concert Hall, Dail Eireann and Trinity College. St Stephens Green is close by with its beautiful foliage, flowers and greenery. A stroll along Grafton Street with its wonderful shops and buskers is not to be missed. Temple Bar is just a few minutes away and is admired by all international guests for its lovely cobblestone streets, energetic night life and friendly atmosphere.